With its jute fibers and loose weave, natural burlap presents a challenge for cleaning, yet there are options for removing odor and spots. The right method of care depends on whether the burlap is loose or affixed to a surface. 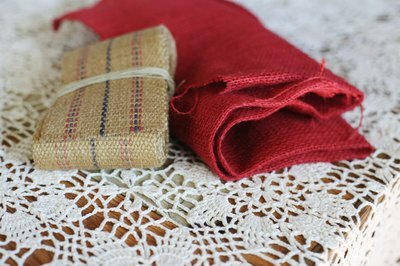 Ideally, care for burlap begins before you use it for a sewing, craft, decor or art project. Burlap can have a strong odor, and it also picks up odors. So whether the burlap comes on a roll from a supplier or is a used potato or coffee sack, its smell could be improved. Likewise, you may have a dog that took a nap on your burlap fabric or craft creation, leaving a smell that you want to remove. Sunlight reduces burlap odor and helps to bleach out minor discolorations. Don't leave the burlap out in wet conditions, including fog. If two or three days time in the sun doesn't remove enough of the odor, sprinkle baking soda all over the burlap and leave the powder in place for at least a day to absorb the smell. If your burlap gets a spot on it, blot it with a damp sponge moistened in room temperature water with mild soap, such as castile soap. Blot again with plain water and then with a dry towel. Washing burlap is tricky because it sheds a lot of fiber. If it's loose material or a covering you can remove, such as a cushion cover, wash it by hand in room temperature water with a small amount of vinegar. A utility sink or bathtub with a screen trap over the drain works well for a large amount of the fabric. Avoid using a washing machine unless you have a product with a care tag that recommends it, such as a tablecloth with a fine weave. Most burlap comes apart in a washer, and the heavy lint could damage the machine. 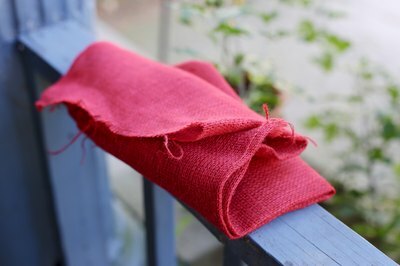 Dry the burlap by hanging it on a fence or rack. Burlap absorbs moisture easily and can develop mold if left damp. If you are using the burlap in a project with damp materials such as plaster or clay, washing the burlap first to remove the sizing may help to reduce the risk of mold. Sizing, a protective substance used on woven textiles, might contribute to mold, according to the Cascadia Art Conservation Center. Check that the burlap is dry to the touch before you use it. 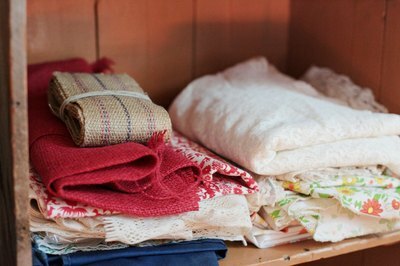 Don't store or display the fabric, or your burlap creations, in damp locations such as the basement or bathroom. Keep burlap in a light, warm place with good air circulation to prevent mold. For many burlap home decor and craft items, regular dusting is all the care that is needed. A spider-web remover with a telescoping handle works well to dust burlap ceiling panels or wall hangings that are out of reach. Use a vacuum cleaner with a brush attachment to remove dust from burlap upholstery, cushions and wall coverings. Vacuuming also works on sturdy craft objects such as burlap-covered waste baskets, bulletin boards, flowerpot covers or canisters. 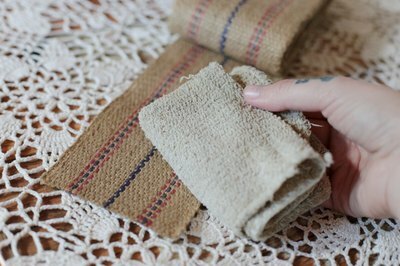 Avoid vacuuming loose edges of burlap, as they may ravel. Can You Use Burlap as a Ground Cover to Stop Weeds? What Is Burlap Made Of?